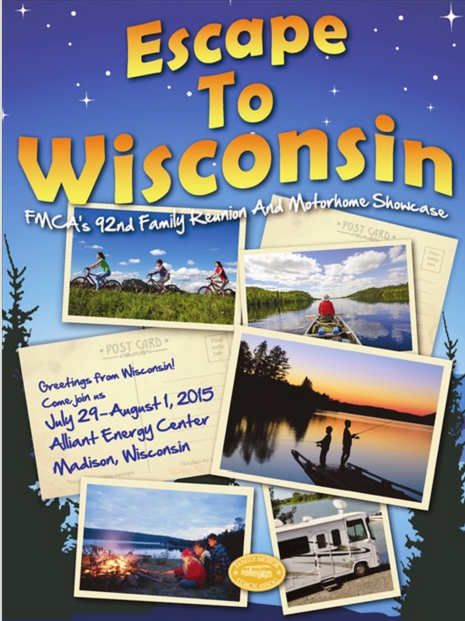 We are here, in Madison, Wisconsin getting ready for our week (7/28/15- 8/2/15) at the rally! Here is our schedule of classes, and one of them you can watch from home! The Picasa and Google Photos seminar on Friday at 8am Central time will be webcast. Jim and Chris of Geeks on Tour use lots of tech gadgets as they travel in their RV. Smartphones, Tablets, Computers, Cameras, GPS devices, a Quadcopter and an Amazon Echo. It’s not about the devices though, it’s about what you can accomplish with them. You will learn how they tell their travel stories online with photo albums, maps, movies, and blogs. Even if you’re not a traveler, if you have a story to tell you can use pictures, maps, movies, and blogs to make it come to life. Jim and Chris’ blog is at www.geeksontour.blogspot.com – then you can click the menu options for Photos, Videos, and Maps. You’ve probably been to the Google Maps website to search for a destination. But did you know that you can use Google’s My Maps to plan a multi-stop route and it is instantly available on all your mobile devices? You can create and save custom maps to record your travels and share them with friends and family. Your custom maps can even include your photos, links, and descriptions. This seminar will show you how! Whether you’ve had a smartphone or tablet for years, or you’re just thinking about getting one, you will learn something in this seminar. We will demonstrate why they are so much more useful than a regular phone. It is a navigation device, an excellent camera, an emergency alert system and so much more. We will demonstrate how to install a QR code scanner and use it to find the information stored behind those funny looking square codes. We will show you how to turn your phone into a Wi-Fi hotspot so your tablets and computers can get online when you’re traveling. Thu 4:30 Seminar 10: 2.5 hour hands-on Smartphone Photography. Pre-registration required. $20. Learn by Doing! This 3 hour, hands-on class is open to anyone with Android phones or tablets as well as iPhones and iPads. Bring your device fully charged, and a charging cable just in case! We’ll start with the basics of taking pictures, selfies, and videos, then move on from there! You’ll learn what that HDR setting means and how to use it. How to take Panoramas, see your pictures in place on a map, and other special features. That camera lens is not just for capturing memories – you can also capture documents (no need for a scanner or fax!) or scan QR codes that get you discounts at your favorite store. This class is limited to 30 people. Pre-registration and a $20 fee is required. Sign up at the Geeks on Tour table in the Information Center. This is the one that will be webcast. Just follow this link. Do you have a process for handling all your pictures? We use the free tools from Google (Picasa, Google+ Photos, and Web Albums) to show you how to Organize, Edit, and Share your pictures. We start by taking pictures with our smartphones and showing you how they get to the computer, then Picasa takes over to make the pictures look better and share them online with Google Photos. Learn how to make your own movies. We will use Movie Maker, a free Windows program from Microsoft and also give a quick demo of Google Photos movies on an iPad. Use your pictures and video clips, add narration and music. During the seminar, we will create a movie, step by step. You’ll see the original pictures and video clips and learn how to combine them, arrange them, add transitions, music, and narration, and render the finished movie. All you have to pay for is the popcorn! Using material from our weekly “What Does This Button Do?” online show, we will show you as many Apps as we can fit in the time allotted! Every traveler needs to know how to navigate with their mapping app, we will demonstrate with both Google Maps and Apple Maps. For foreign travel, Google Translate is a must. For RVers, we love Where Am I?, Gas Buddy, and Field Trip. We use several campground searching apps, Social Networking apps, Personal Safety apps, and many more. Published by MrsGeek, in Blog. Tagged with #GeeksWhoTeach, Apps for Travelers, fmca, FMCA Rally, Geeks on Tour, Google Photos, Rallies, smartphone cameras, Smartphones, Technology for Travelers.